The RAYSHIM line of shimming materials contains five different sizes, fitting almost any type of machine foot. The user can choose between solid stainless steel shims and laminated shims in both brass and stainless steel. 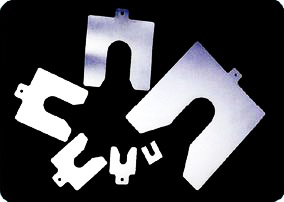 Solid shims can be provided in a handy box, containing 10 shims each of 5 different thicknesses, from 0.05 to 1 mm. They are also available as packs of 10 in single thickness, from 0.05 to 2.00 mm. Packs of 20 laminated shims are available in both brass and stainless steel. Each shim has a thickness of 1.00 mm, divided into 12 layers. Laminated shims always fit – just peel off the required thickness. Solid shims in stainless steel are available packaged in a convenient aluminium framed case with a compartmentalised high density foam insert. The refillable case contains 360 of the most fequently used shims, ie. the equivalent of 2 x S1-, S2- and S3-PAK plus 20 shims of each size S1, S2 and S3 in 2 mm. The case is overall 350 x 300 x 160 mm, with fully packed weight of 13 kg. Pre-cut Shims make shaft alignment and other machine levelling tasks easier and more cost effective.